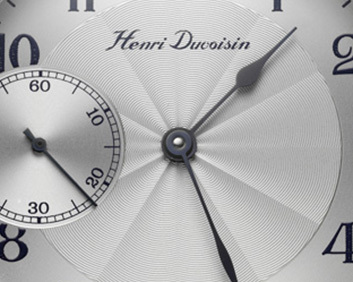 Regulator Henri Duvoisin watch with an historic movement Fleurier. Limited edition of 25 pieces numbered, red gold, made in Switzerland. The Regulator Henri Duvoisin masterpiece is a luxury watch with a 19'' Fleurier (FEF) movement built in 1950 with a manual winding-mechanism and with the two main hands which are not coaxial. This unique heritage made possible the creation of an exclusiv and limited edition of 25 numbered watches in red gold case of 18 carats.